This past weekend during the Montreal High Lights Festival, we participated in Nuit Blanche in the Griffintown Cultural Corridor. 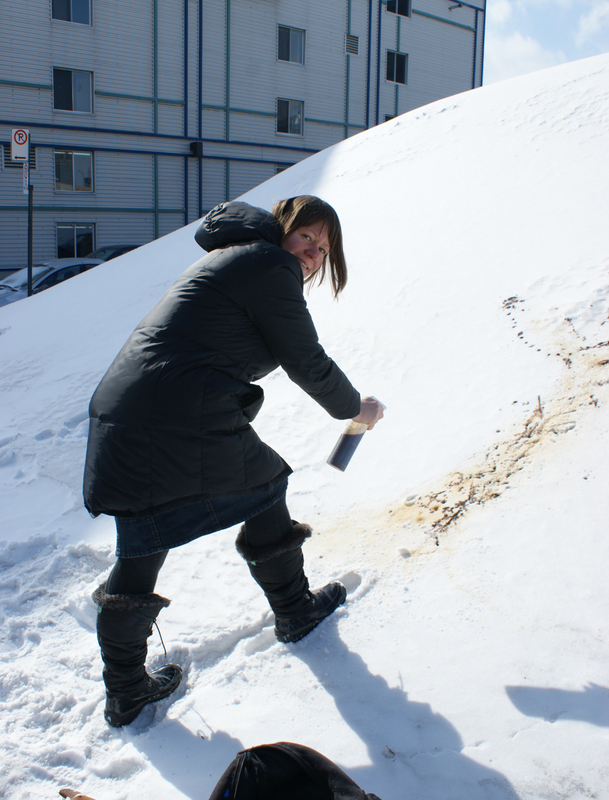 It was a great deal of fun to put our recent experiments in Herbal Snow Painting to the test. 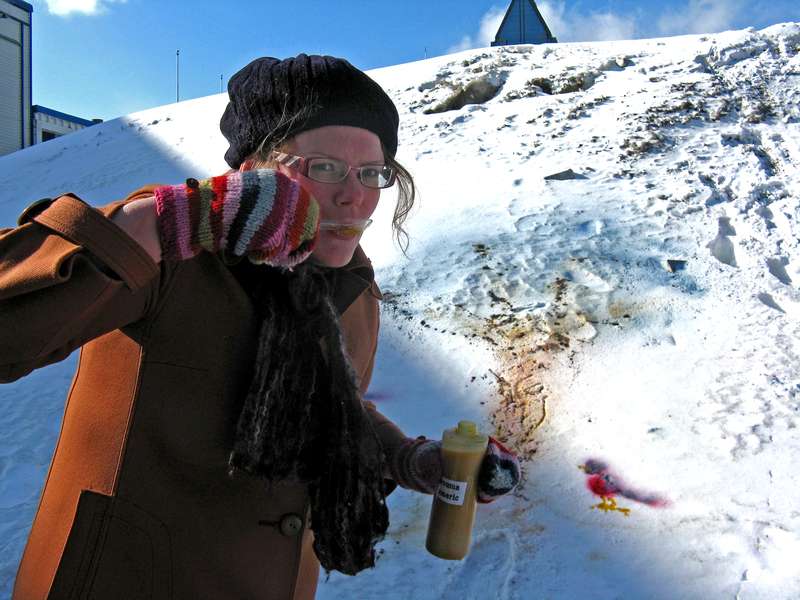 Despite the cold, we had many keen public participants join us in creating some snow paintings! We began the day with a large canvas; on this we painted a tree and birds using alkanet and plantain, cabbage, nettles, blueberry, turmeric, coffee, beets, and hibiscus. 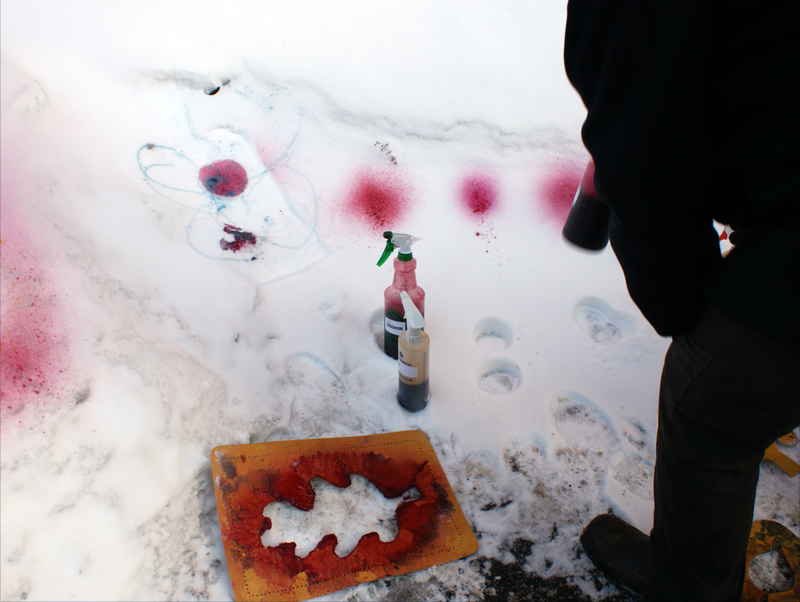 We moved the activity along the expanse of our large snow-hill, stenciling some simple leaf-shapes in amongst the poles and pilons that poked up through the snow. This intervention would hopefully give people pause on their daily walks. The Community Participation area was a lot of fun to fill with boldly painted graphic designs. 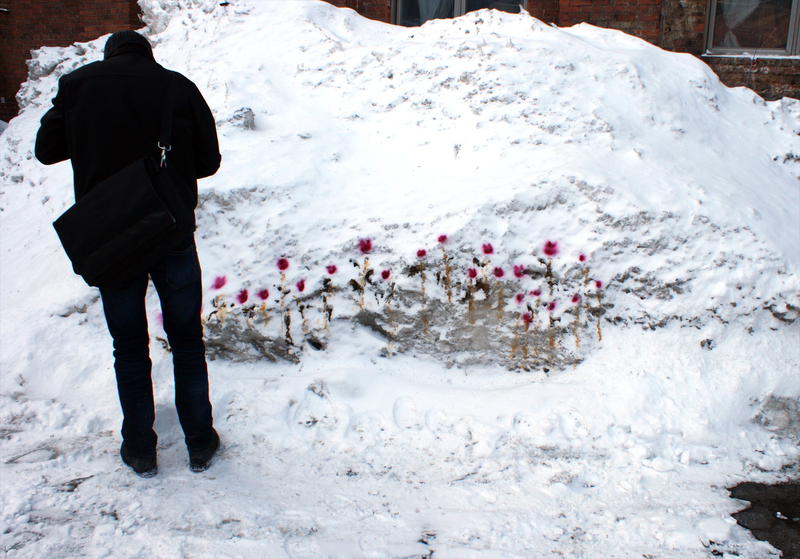 There was a little shed at the end of this (regularly a parking lot) space, and it housed a fibre arts installation. 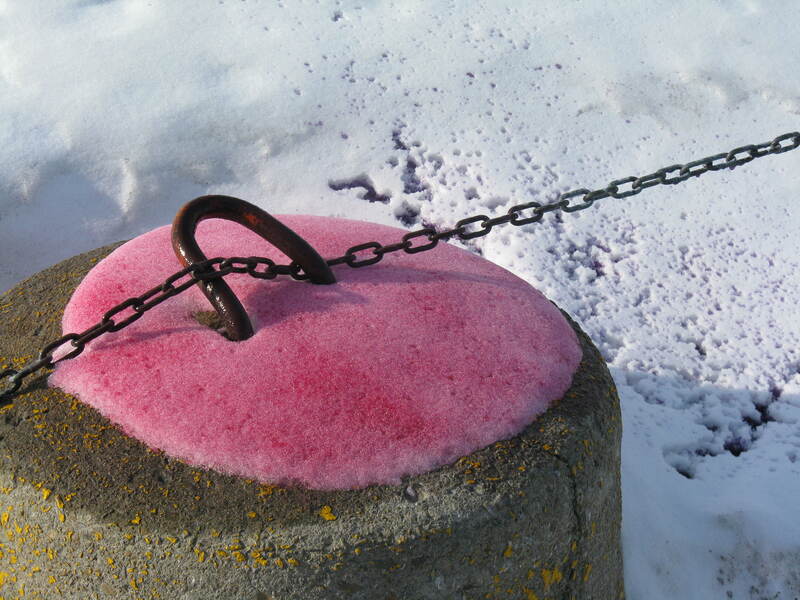 The fibre artists in this shed were a little frustrated that people were not making their way to their exhibit, so we went about remedying that problem. 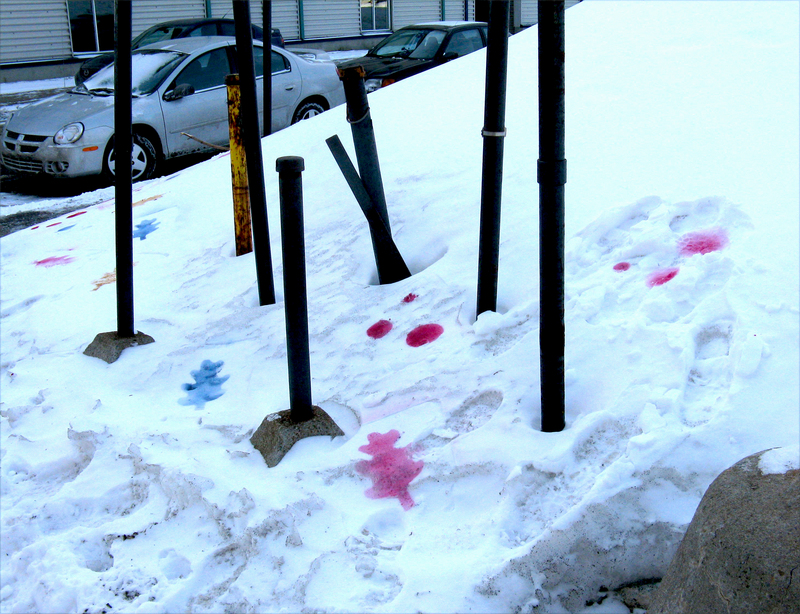 Patterned, stenciled leaves, boldly painted arrows, and beautiful colours glowing in the snow enticed people to enter this parking-lot space. They could see that it wasn’t just barren and empty; it was alive and vibrant with activity, colour, and interesting smells! 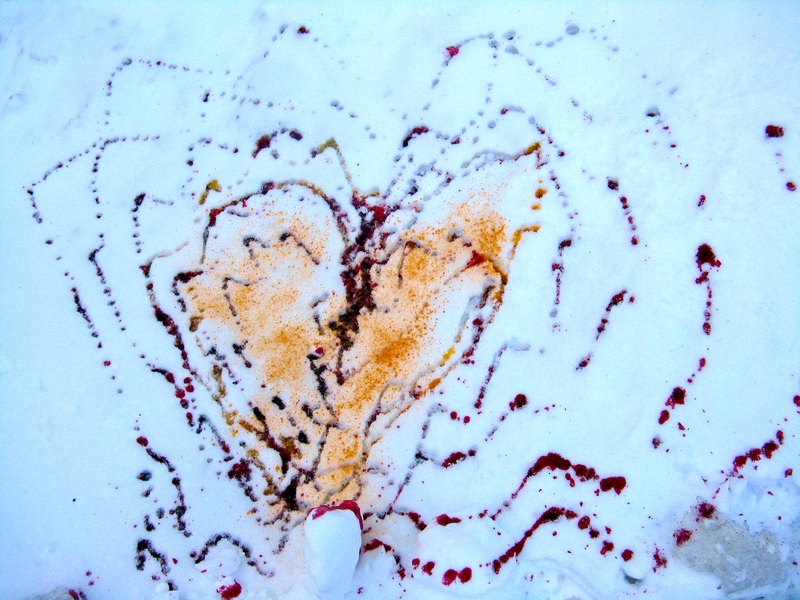 We encouraged people to try out snow painting for themselves, and we had many takers. 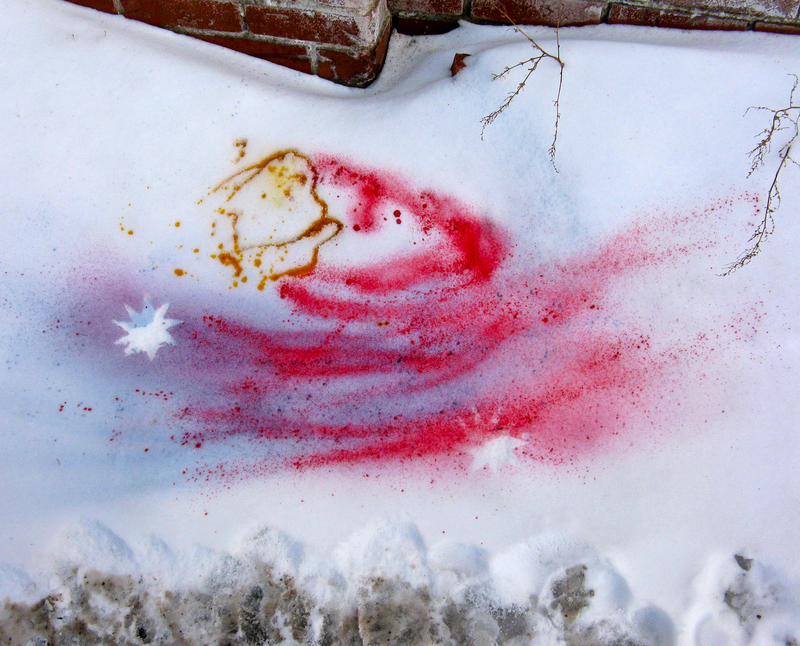 Some very beautiful temporary paintings were made that day, and we took great joy in documenting the activity. 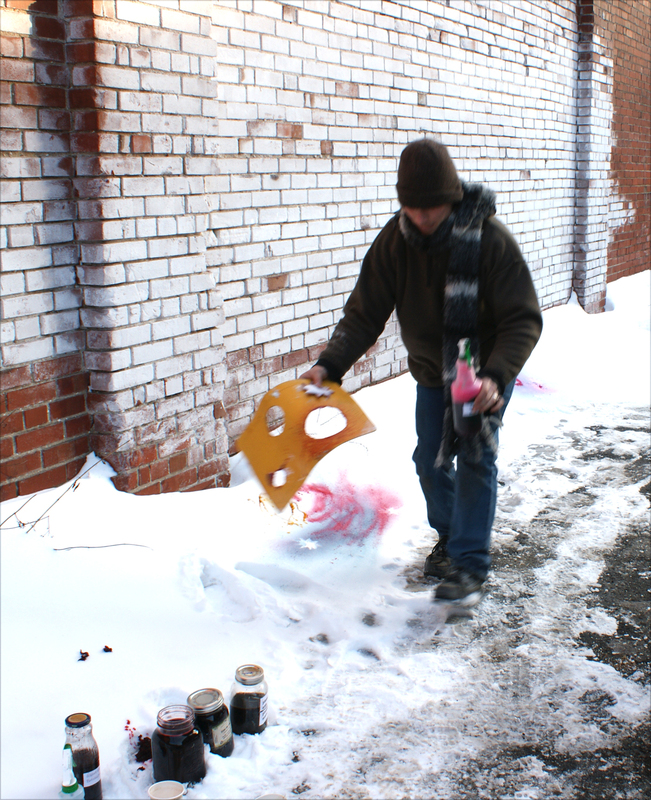 One concern we have with sharing the work in public, is that unsuspecting people might assume that the work was made with toxic spraypaints. 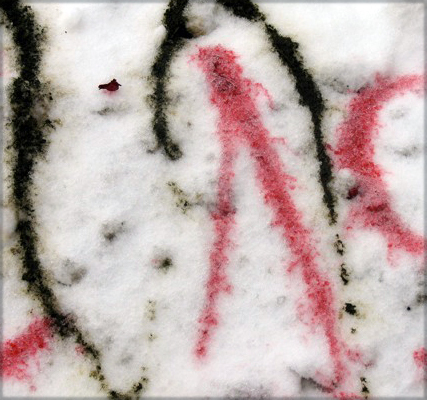 To deal with this, in the future we will tag our creations with a stenciled “fleurbain” signature, and the words “herbal pigments”. 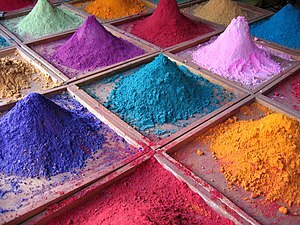 Hopefully over time people will recognise this means that the pigments we use are not only non-toxic and natural, but are even downright edible. 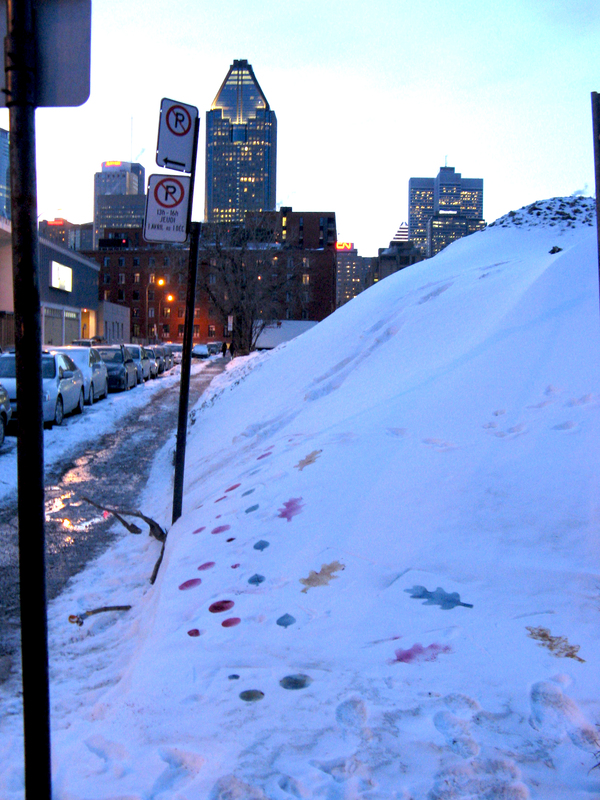 Keep your eyes open, Montreal, for renegade Snow Paintings… and keep your eyes on our Workshops Page for upcoming events! To see the full album of photos from this day, go to our facebook page. tasting the paint... normally you can't do this with paint. Nuit Blanche. We’ll be there! 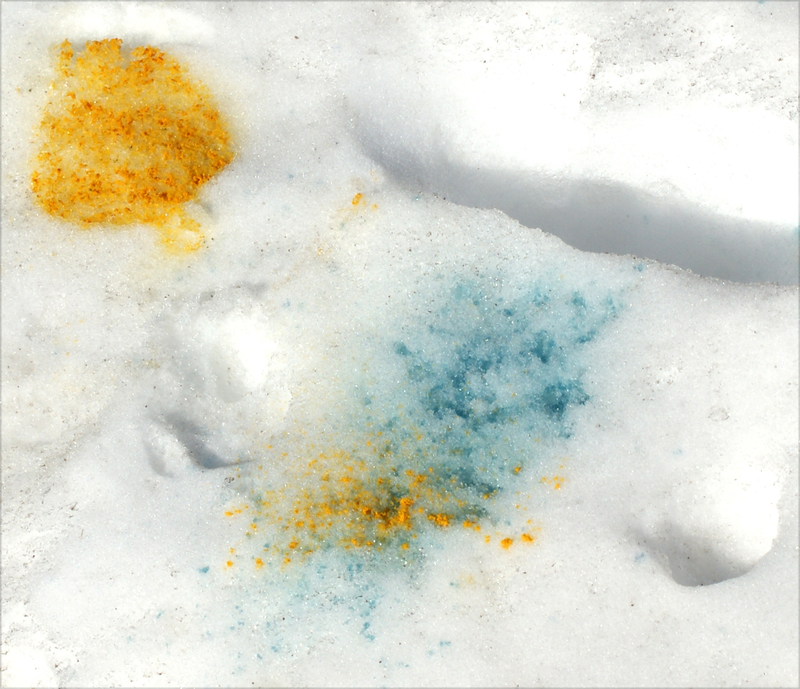 Exciting times are ahead; this February 26th from about 5pm to 9pm (thorough details will come later…) we (Tammy Schmidt, Clinical Herbal Therapist and Natasha Henderson, artist) will be participating in Nuit Blanche as part of the Montreal High-Lights Festival! 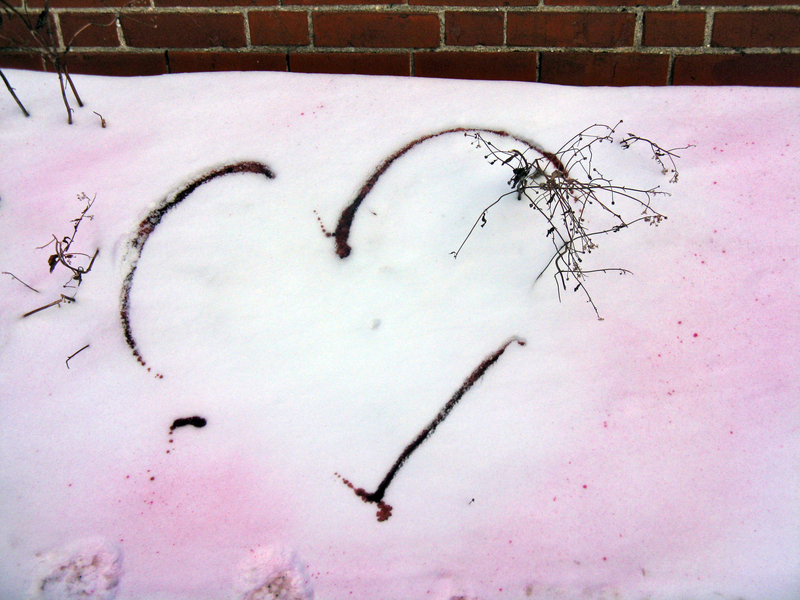 Our objective: to paint in an unusual way, using nature within the city. 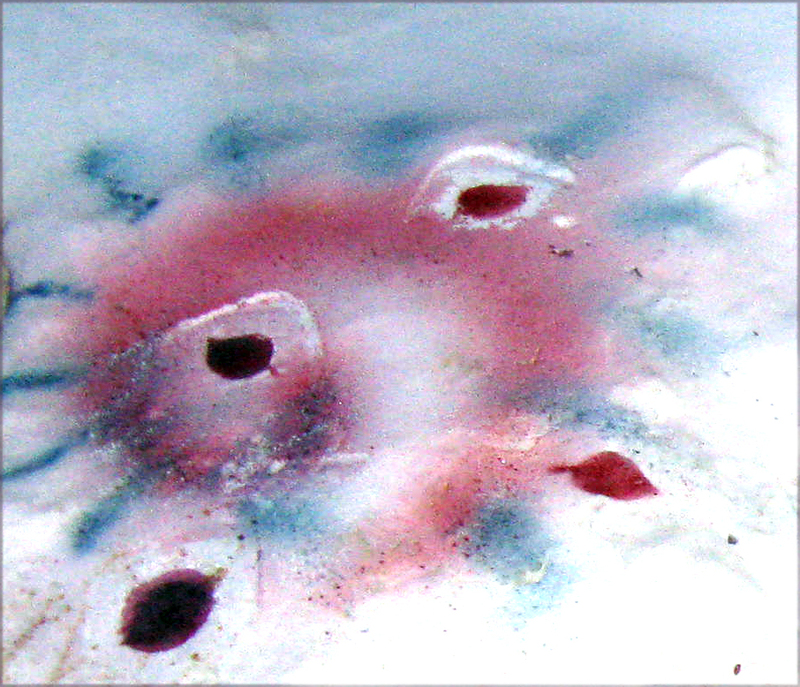 We will be painting using natural pigments; pigments that are not synthetic nor harmful for the earth. 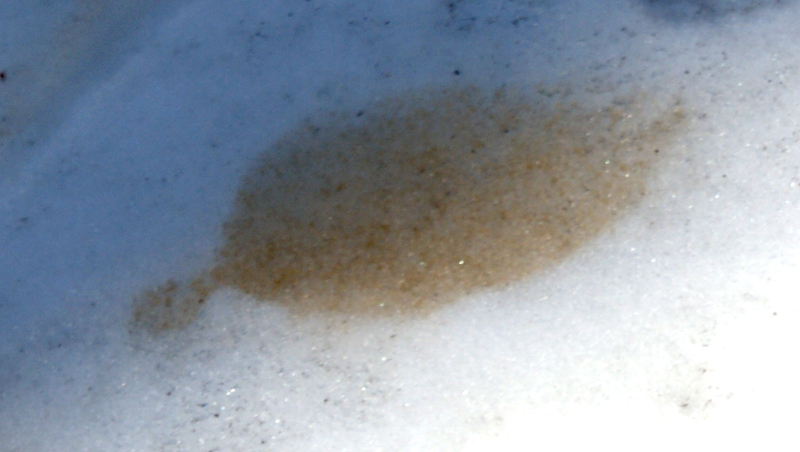 The body of the paint, as well as the canvas, will be snow and maybe ice. 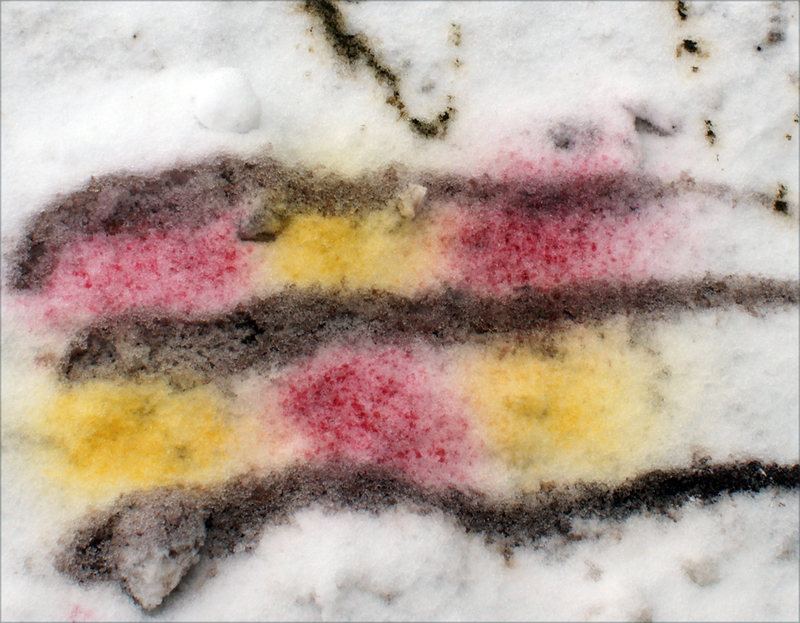 We will invite the public to add to our Snow-Painting, and to learn a little about the natural, herbal-based pigments that we will be using. This project will be the second joint-venture of “fleurbain”; the first being the Herbal Creativity Spa Weekend: Valentine workshops planned for February 11-12. Needless to say, Tammy and Natasha are excited to be able to share their knowledge about herbalism and the arts, and add to the cultural life in Montreal!